Upon rising: Enjoy a full glass of room temperature water (ideally with a dairy-free probiotic). Then have a warm mug of water with 1/2 of a lemon squeezed in. When hungry: Make your smoothie (2 options below) or have a bowl of gluten free oatmeal with 1-2 chopped and pitted medjool dates and a sprinkle of cinnamon. If you exercised, make this one: 1.5 cups almond milk, handful of greens (spinach/kale), protein powder (or 3tbsp hemp seeds), 1 frozen banana, 1/2 cup frozen berries, dash of cinnamon. Blend and enjoy! 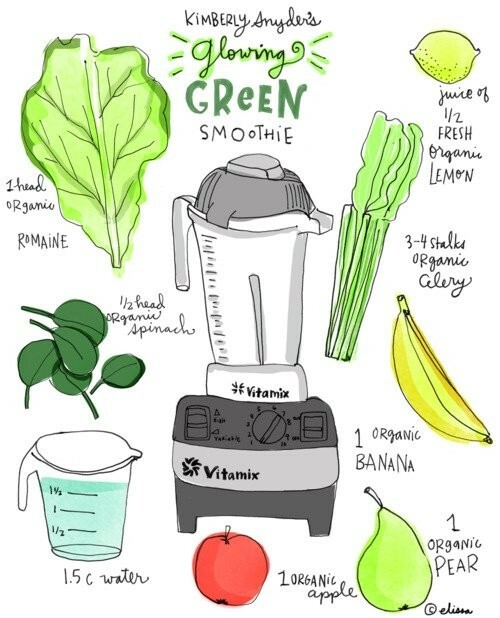 1 head organic romaine lettuce, chopped, 3 to 4 stalks organic celery or 1 small cucumber, 2 handfuls spinach, 1 apple, 1 pear, 1 frozen banana, juice of 1/2 fresh lemon. Have the whole thing or save half for a snack midday or breakfast the next morning. Lunch: Nourishing Kale Salad: Massage 1/2 container of organic curly kale with 1/2 avocado and squeeze of lemon juice until thoroughly coated. Top with veggies like cucumber, tomato and radish. Garnish with sprouts and pumpkin (pepita) seeds. Sprinkle with chili flakes for a metabolism boost. Dinner: A light, low-sodium veggie soup like this: 4 cups reduced sodium veggie broth, 2 cloves fresh garlic (minced), chopped zucchini, carrots, celery and sweet potato, can of fire roasted tomatoes (no salt added), salt and pepper, favorite herbs. Sautee garlic in a little oil, add veggies, dried herbs if using, and sear. Then, add in the tomatoes and veggie broth. Bring to a boil, then reduce heat and simmer covered until sweet potatoes can be pierced with a fork. Top with lots of fresh herbs like parsley and basil and a squeeze of fresh lemon to brighten the dish. Serve with gluten free crackers like Mary's Gone Crackers. Keep it raw by having this lemon-y hemp salad with arugula: 1/2 container of arugula (rocket), 1/2 avocado, chopped cucumber (leave skin on for pretty skin as it’s loaded with zinc! ), chopped apple or pear, fresh mint, sunflower seeds, 1/4 cup hemp seeds. Keep it super light by dressing with a squeeze of lemon or lime. *If hungry between meals, drink a full glass of water. If you're still hungry, eat as many veggies as you'd like or a serving of fruit. Maybe a handful of almonds. Enjoy a cup or two of green tea throughout the day for a boost.